12.5" RCOS @ ~f/9 (2880 mm fl) 0.64 arcsec / pixel. The Zoomify image scale is 0.64 to 3.58 arcsec / pixel. CCDSoft, CCDStack, Photoshop CS w/ the Fits Liberator plugin, Noel Carboni's actions and and Russell Croman's GradientXTerminator. eXcalibrator 3.0 beta (g-r) color balancing, using 90 stars from the SDSS-DR7 database. PixFix32 (pre-beta) to repair column defects. CCDStack to calibrate, register, normalize, data reject, combine the sub exposures, selective deconvolution and the RGB color image. PhotoShop for on-linear stretching and LRGB combine. Noiseware Pro, a PhotoShop plug-in. Arp 104 (NGC 5219 and 5218) was first noted by William Herschel in 1790. However at that early date, the two galaxies were thought to be nebulae. 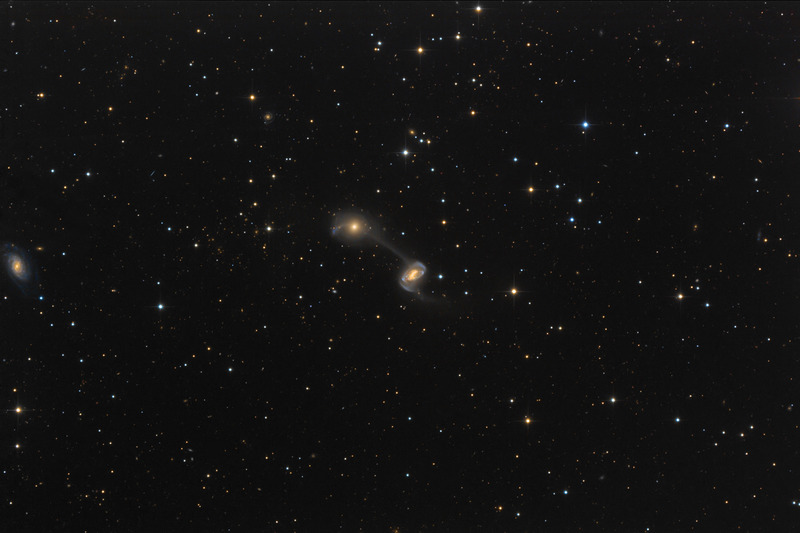 The interacting pair of galaxies is located in the constellation Ursa Major at a distance of about 17 million light-years. The connecting string of gas, dust and stars is about 22,000 light-years long. The image also contains 2290 background galaxies down to magnitude 22.5, with many even fainter visible. Also of interest are 13 QSO's. The most distant is at about 12.8 billion light-years, with a redshift of 3.52.